Earth Alerts allows you to monitor in near real-time a variety of natural hazard events that are occurring anywhere around the world. Alert notifications, reports, and imagery provide the user with a convenient way to view natural phenomenon as they occur, whether close to home or some far-flung corner of the globe. It gets a -1. One of the worst and least intuative programs I've ever encountered. Certainly not worth the time I wasted with this peace of crap. Thank you very much. Does not even start after installing, resource hog too. Stupid noobs can't write a program that works with large fonts! Unusable with large fonts! PLS FIX!! I am not sure were some of these reviews come from. They don't seem to be reviews at all just statements about personal preferences. This software is what most of the other weather and alert software should be. It provides relevant information about earth events that you get to chose. The author seems to make daily updates. That is a little problematic. I am not sure if this is a beta release. The only suggestion I would make is that it becomes skinable or more customizable in appearance. The content and sources are excellent. Bottom Line: It gets a -1. One of the worst and least intuative programs I've ever encountered. Certainly not worth the time I wasted with this peace of crap. Thank you very much. great program for sure, well done. Excellent program! Every PC should have this. Do not listen to the clueless stupid one star reviewers. There's no other way of putting it, Earth Alerts is a dog of a program. One wonders why the programmer bothered. I was hoping this program might have been a replacement for XEarth--an excellent program that's been around since OS/2 days but which has not been updated since the USGS - U.S. Geological Survey updated their IP addresses a while ago, now XEarth's earthquakes indicator won't work. Any comparison between this heap of junk and XEarth and others is a waste of time. 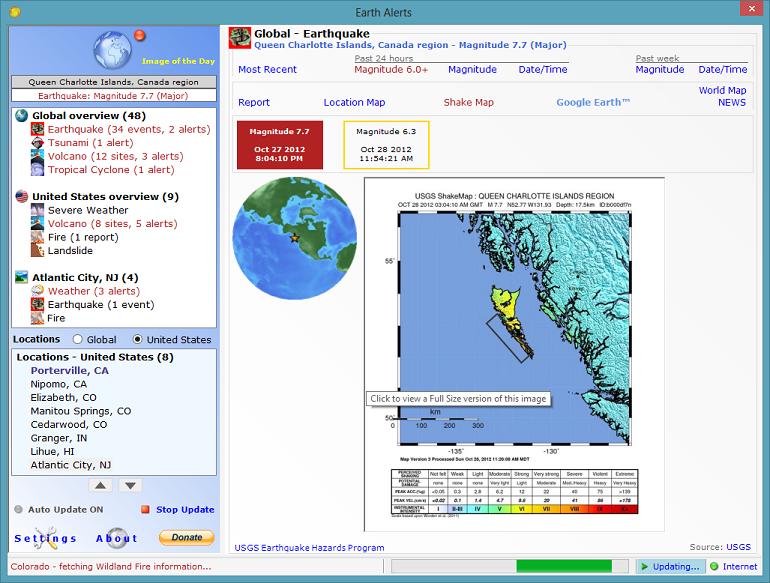 Earth Alerts has no proper dynamically expandable graphics etc., at best it uses the tiny USGS graphics which are nigh on useless if you're trying to use the program as a desktop backdrop. Moreover, even using the program is confusing, items that ought to be links simply aren't etc. "I haven't tried just release and I don't plan to. I've tried earlier versions twice and got rid of them. It surely does not warrant a 5 star rating"
Your 1 start review is not valid for this particular build according to your own words. Therefore, you do not know whether this current build warrants a 5 or 1 start rating. Why trash something you haven't even tried? I haven't tried just release and I don't plan to. I've tried earlier versions twice and got rid of them. It surely does not warrant a 5 star rating.